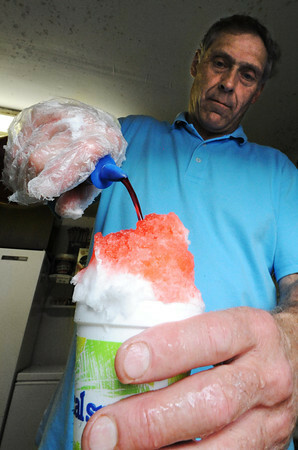 Owner/Manager David Schaper, of Cherryvale, Kan., pours a mixture of strawberry, coconut and a little cinnamon syrup, better known as Tiger Blood, Thursday evening, July 26, 2012, at the Tropical Snow station in Pittsburg. Schaper said Tiger Blood is the No. 1 seller.